Even though I have been working for the (self-declared) non-evil empire for a while now, I still have a lot of ties to the Microsoft community, even beyond drinking Weissbier with Christian Weyer. 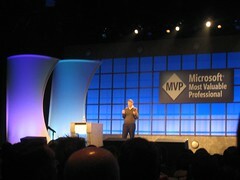 I am particularly proud that I have been able to maintain my MVP status, Microsoft's Most Valuable Professional award. Having "Google" on my badge certainly gave some softies the chills at this NDA-only event. But I think having me there is a great testimony to the MVP program being focused on community, not corporate rivalry (and chair throwing). Furthermore, this event focuses on languages, frameworks, and tools for the Microsoft developer community, whereas very few of Google's offerings (e.g., GWT) are targeted directly at developers. 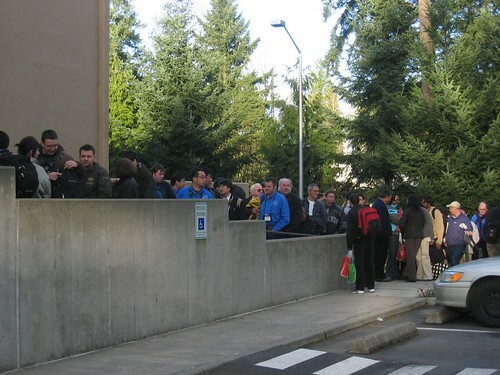 In any case, the event was a great opportunity to spend some time with fellow MVPs and to get access to Microsoft product groups in a more intimate setting than the usual TechEd mayhem. Challenges in programming for multi-core chips. How can we enable the average developer to write programs that take advantage of today's (and tomorrow's) multi-core chips? Transition from 32 bit to 64 bit computing. According to Bill we are not going to see another address bus width change for quite some time, so this one is exciting. Video as the "final frontier" of the Internet. According to Bill, YouTube is just the very beginning. For example, Bill is interested to see how businesses and consumer manage their video data, such as classroom lectures, company meetings etc. Content will be more targeted to viewer's interests and so will be the ads. Programs no longer run on a single computer but on a vast, dynamic infrastructure. A developer won't even know which machine the program runs on – a machine is selected based on criteria. This also raises questions of how to deal with problems. For example, which exceptions are meant for the hosting operator (e.g., disk full, network failure) and which ones are meant for the developer (e.g. application exceptions). Having divided roles requires a much better separation. Fun quote: Bill started off one of his topics talking about "Microsoft and others who do search…" Who might he be referring to? The whole transcript of his talk is available. Most remaining sessions of the summit fall under our individual non-disclosure agreements with Microsoft. I wish the product teams had used that as an opportunity to give us some insights beyond the (not so secret) Orcas CTP (while on that topic, it seems that you want to install the 7-part version, not the 9-part version). Anders talked about Linq (no surprise here), the Connected Systems Divisions showed Workflow enabled Services (interesting, and also in the CTP). I was excited to see that the CTPs now come as Virtual PC images so I no longer have to install OS, .Net, Studio etc etc. You "just" downloaded the 5 GB or so and let it run. Excellent idea. I attended mostly the CSD (Connected Systems Division) track. This group unites both the old "Indigo" team and BizTalk. Accordingly, they fielded a number of questions on how they will collaborate etc. According to Clemens "we now love each other." 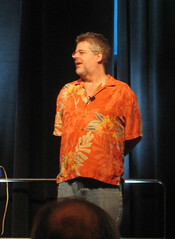 Don Box gave a great session on his current work (super-secret). Luckily, his jokes should be non-confidential. My favorite quote: "I like Ruby for its directness but I always feel a little dirty afterwards"
With the rather strict NDA most that is left to report is of social nature. Scott Bellware was on his best behavior, the Canadians were loud and wore goofy Maple leaf shirts, the bus driver pointed out Bill's house on 76th Ave, the line to the Microsoft Company store was infinitely long (I sacrificed one session to go early), Software in the Store was cheap ($45 for Vista Ultimate), and it only rained a little. It was great to also great to see my friends from far-away places like Japan. As expected, the Japanese team aced the Karaoke contest, and the vegetarian food at the Museum of Flight party was excellent.